Located at 54 High Street, the 15-year-old hotel, 5 stories high, initially measured 125 feet long and 40 feet wide and contained 40 rooms. 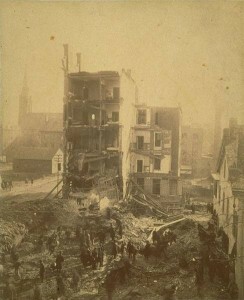 An annex of 24 rooms for employees and guests’ servants was added several years before the explosion. 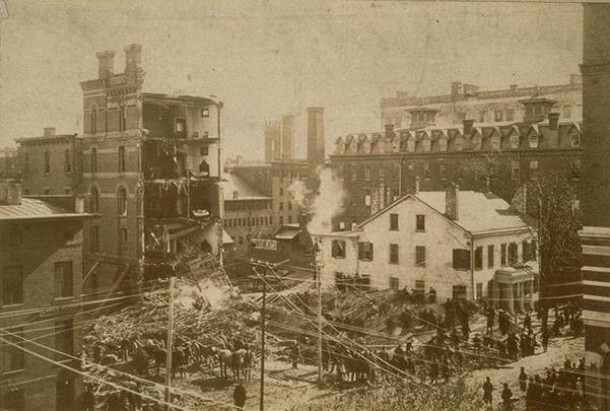 The structure suffered from being built on shifting soil, and although the boiler explosion was to blame for the catastrophe, Hartford citizens, insurance company presidents, and politicians arose in common voice to demand stricter building inspection. 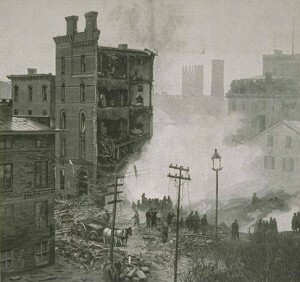 “Nineteen Bodies Found; A Terrible Catastrophe in Hartford. Collapse of a Hotel Filled with Sleeping Guests.” The New York Times. February 19, 1889. Link.